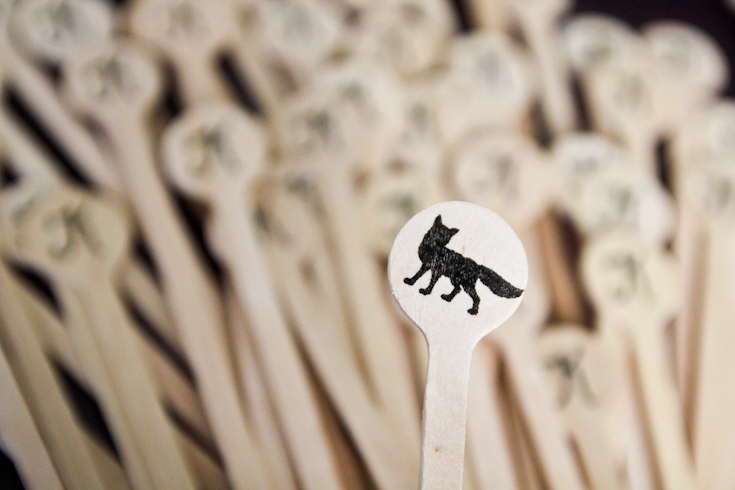 In one of the (many) wedding magazines I’ve drooled on over the past few months on I spotted some custom drink stirrers and fell in total lust with them. 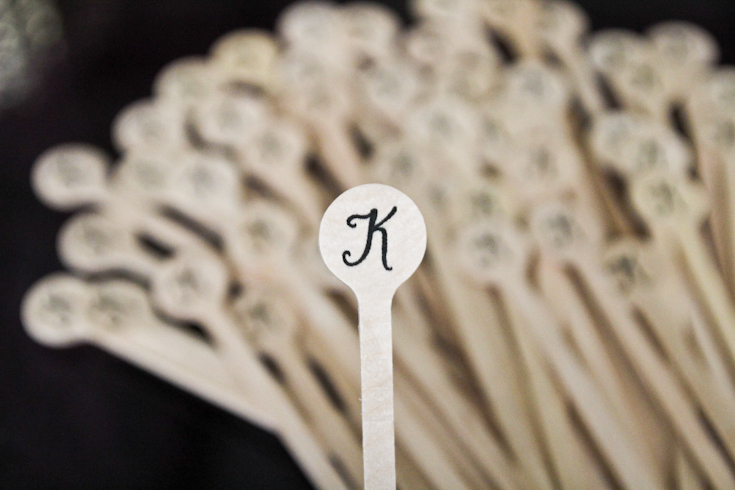 I’m a sucker for personalized details- especially at a wedding! It’s the one time you can shamelessly slap your initials on just about everything. 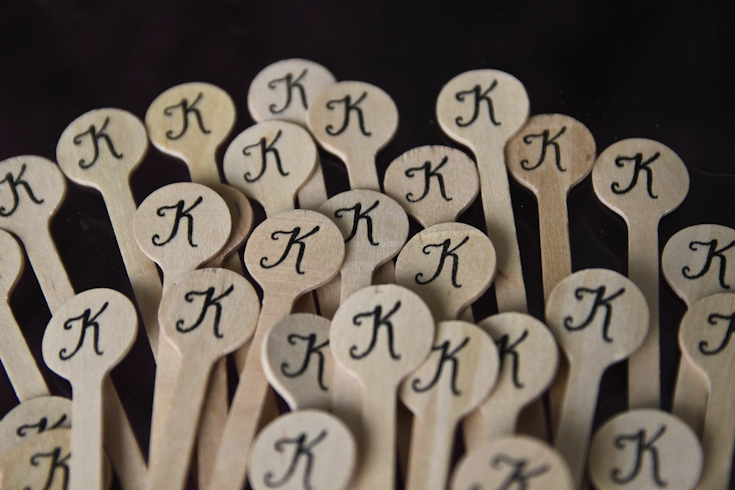 So I started looking around at the prices for said personalized drink stirrers and got some serious sticker shock. 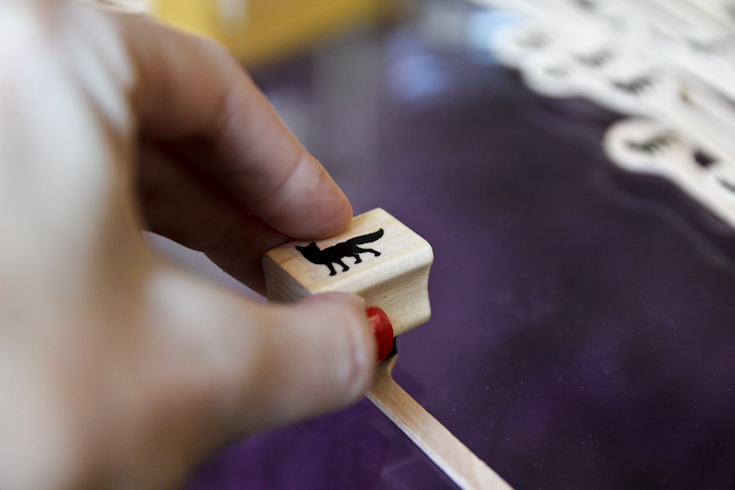 Shelling out hundreds of dollars for mini sticks of wood is just not in the budget. So I looked for a less expensive DIY option. 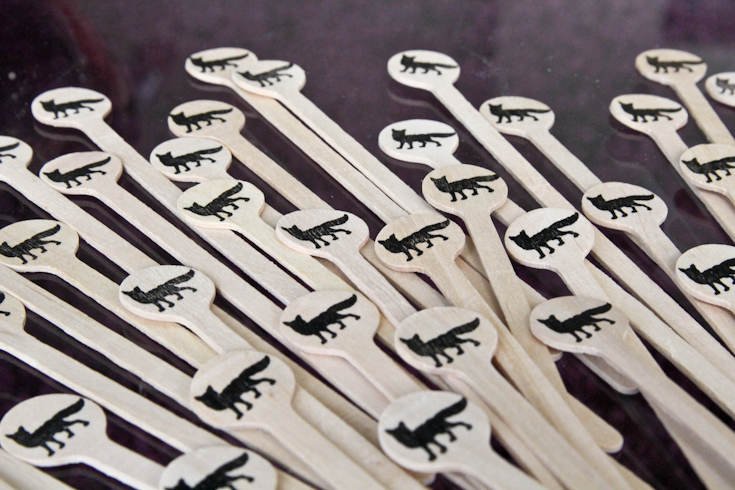 First I hunted down “Stampable” drink stirrers. I found some bamboo ones here that were less than $20 for 500! Hello steal. 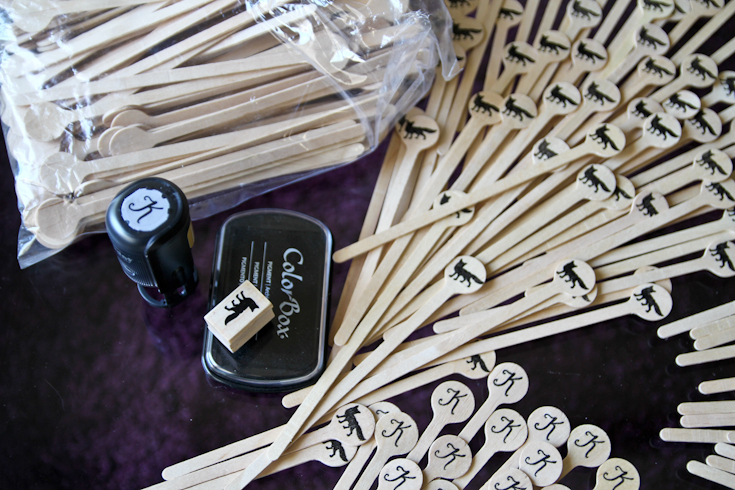 I ordered those right up and then made some stamps in Adobe Illustrator. If you don’t have illustrator you could also use Adobe Photoshop or even Microsoft word, just might take a little more effort to get the sizes correct. 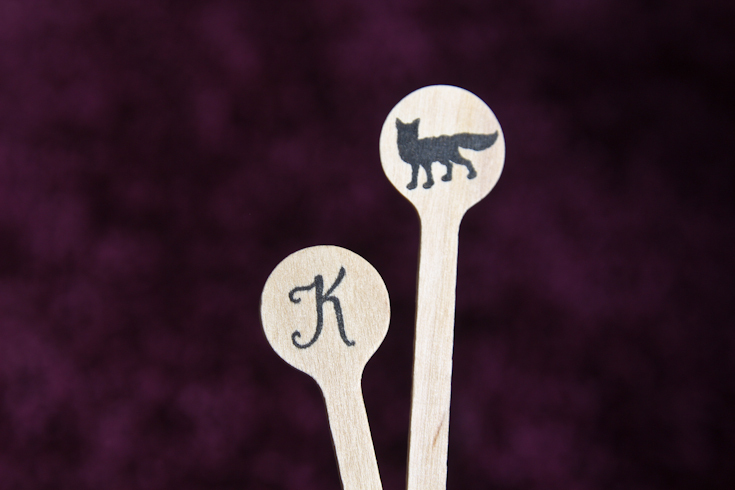 I made two stamps, one with a “K”, for the shameless initial part, and the other a fox, which is a nod to the history of our venue and part of our wedding theme. When all the supplies arrived I put on a few episodes of Law & Order and stamped my life away. To do about 400 it only took about two hours, or as I measured it, two episodes. 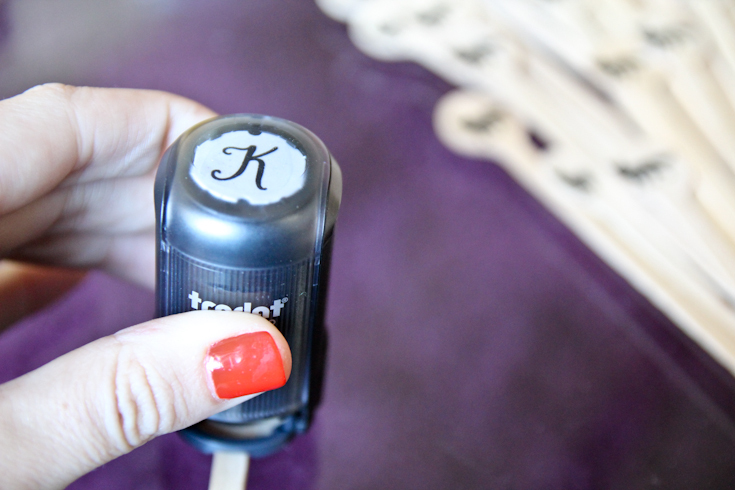 The round K stamp was much faster because it was self inking and lined up right over the drink stirrer. 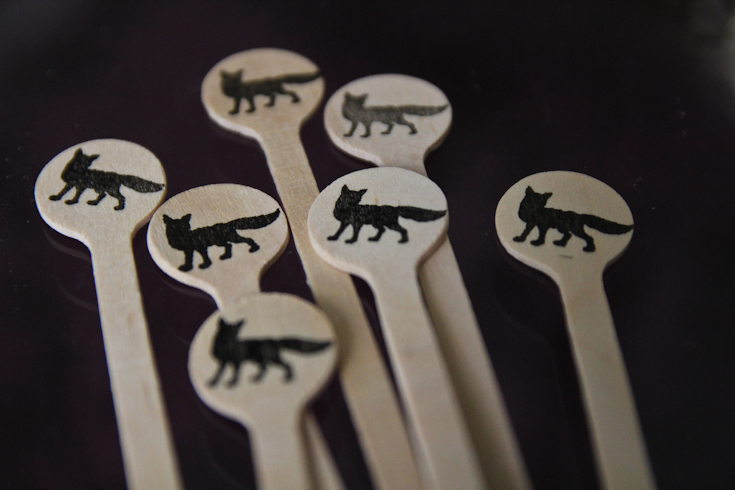 The fox was a little trickier because I had to ink it and try to line it up evenly each time. I love the way they turned out and plan to put these guys in gold containers on the bars at the wedding, and maybe in our signature drinks. crafting note:: When the bamboo sticks arrivedthere were some that were cracked andwarped, so plan accordingly when you order. 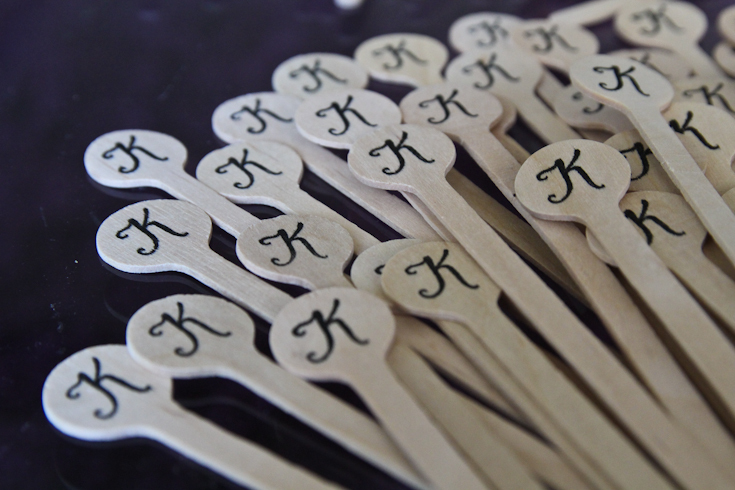 I would allow for about 50 wasted ones between bad stamping skills and wood issues. 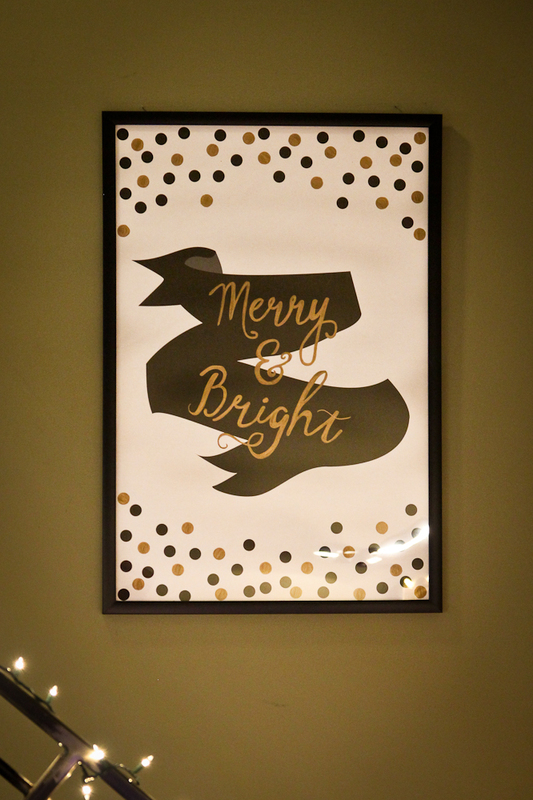 Merry and Bright: Free Download Holiday Print! Frame it (optional) and hang it! And that’s really all you need to know. BUT if you want more details or are just trying to pass some time at the office, read on. The inspiration for this project was “disposable decorating” driven by my lack of storage in my loft. Basically I have no room to store things so I wanted to make holiday décor that I could throw away after the holidays or store easily. Enter engineer prints. In case you haven’t heard of this magical thing that is an engineer print, I’m going to tell you all about it. For just a few dollars you can get massive black and white prints made at Staples. You just go to their website and upload your photo or design, select what size you want and you can usually pick it up in the store the next day. They probably also ship, but it might be more expensive than the print! I had experimented with engineer prints prior with good results and decided that it would also be handy for some holiday cheer. I used Adobe Illustrator to create the design, saved it as a .jpg and ordered away. 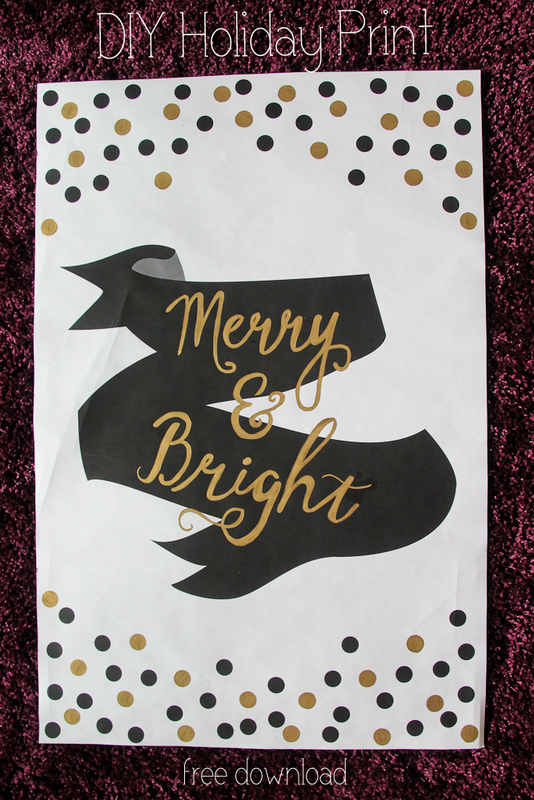 The next day I picked it up at Staples along with some gold sharpies which I used to add color in some of the dots and write “merry and bright”. 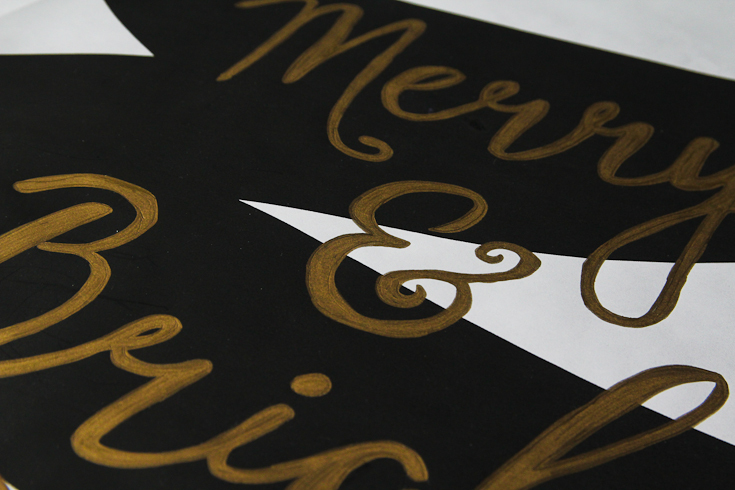 The paper is super thin so you can stick it directly to a wall if you want to. I ended up finding a really good deal on a poster frame on Amazon (here is the one I used) so I framed it and stuck it up on the wall. 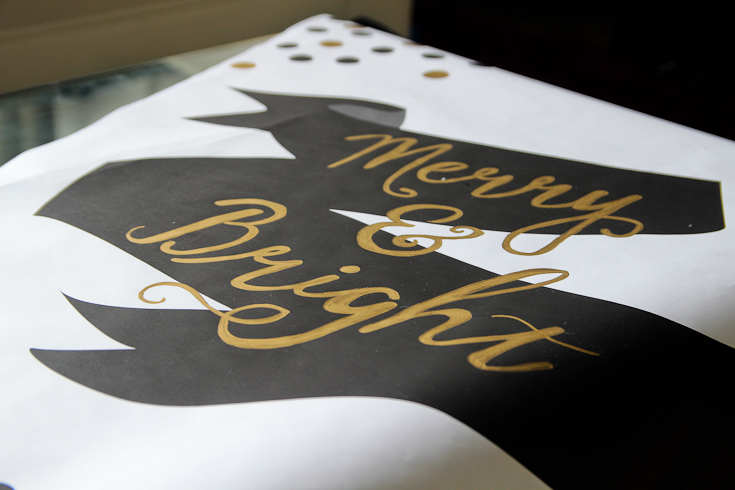 When the holidays are over I plan on making a new print to replace it with. 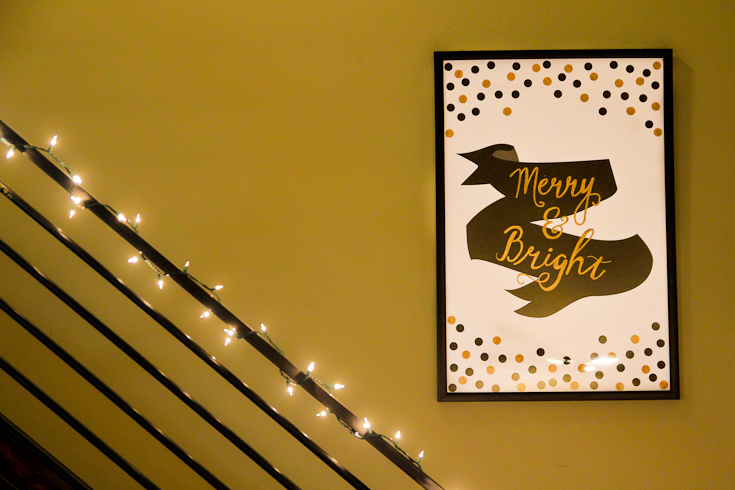 Hooray for seasonal and affordable art! If you are done with your holiday decorating, this could also make a cute happy birthday sign to post on your co-workers cubicle, or a place to write your favorite quote or lyric. The sky’s the limit!